No, this is not just a coast-dweller’s version of running for a bus, but it’s what I plan to be doing in Wellington on Sunday 19 June. Over this last field term in PNG I’ve come to enjoy running both as an activity in itself, and for its positive effects on my mental and physical health. Some time ago, I decided I’d like to set myself the challenge of running a marathon and so I entered the Wellington Marathon which takes place in a few days’ time. More recently still, I’ve felt that I’d like the last few months of training, and the event itself, to contribute to more than just fulfilling my own slightly mad mid-life goal. As I was thinking about this, one of the Anglican Missions Board’s Lenten Projects particularly drew my attention. The Project is aimed at raising NZ$15,000 to purchase a dinghy and outboard motor for Popondota Diocese, and especially to service the needs of Tufi Deanery, within that Diocese. The Maisin language community, where I have been involved for nearly 15 years, is located within Popondota Diocese, and in fact within Tufi Deanery too. From my own experience of living in that area, where there is no road transport, I am well aware of how important reliable boat services are to meet the needs of local village communities. I have had enough adventures, and misadventures, of my own involving boat travel in and out of the Maisin area to convince me of the value of a dinghy with a sound motor to any kind of enterprise in a coastal area. 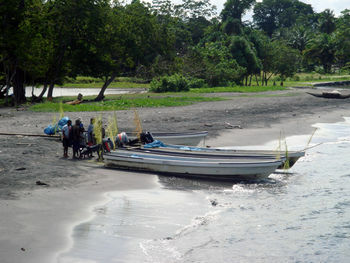 The dinghy that is the subject of this project would primarily be used for visiting parishes and missions, getting supplies to schools and health centres and assisting village people to get produce to markets. If you are interested, you can read more about it here. I would love it if the activity of trying to get myself around 42.2 km of Wellington waterfront could also somehow assist in meeting needs along the coastline of Popondota Diocese. If this in any way strikes a chord with you and you would like to have a part in ‘running for a boat’ as well, there are different ways you could do that. 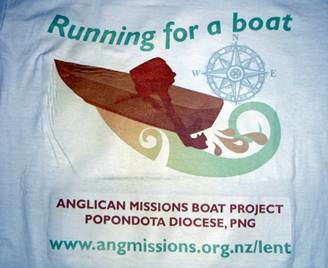 If you would like to make a financial contribution to the Dinghy Project you could do that either by internet banking or by sending a cheque to the Anglican Missions Board designated for the Dinghy for Popondota. Contact glen@angmissions.org.nz or ring the Anglican Missions Board office for more details on +64 4 473 5172. I realise that many of you won’t be in a position to give to the project, but perhaps you could pray that this need would be met, and that once provided, it would be wisely and fruitfully used to serve the people in these more remote communities. I’d also really value your prayers that I’d last the distance! In the last few months, I’ve pounded footpaths in Christchurch, Alotau, Waikanae, Wellington, Oamaru, Dunedin, Winton and Middlemarch in preparation, but 42 km still feels pretty daunting. Kerre Woodham’s ‘Short Fat Chick to Marathon Runner’ has been recent motivational bedside reading – perhaps I can learn something from another vertically-challenged midlife runner! Thanks for joining me in this challenge, I’ll keep you posted on how it goes! I promised an update on my ‘run for a boat’ in the recent Wellington Marathon. Emotional spectrum (in roughly chronological order): nervous excitement, buoyancy, confidence, weariness, misery, despair, more misery, dawning hope, vast relief. Gratitude. If the Dinghy Project benefits at all from this exercise the misery will be more than compensated for, and the gratitude greatly multiplied!